This is when i realize i may be working on too many projects… A few months (ok a lot of months) ago i started rewriting from scratch and greatly expanded the HydroDuino project’s software side, and had a working, if basic version,but completely lacking in modularity (basically it was a completely monolithic, tightly coupled app) and hard to maintain and expand. So i started an almost complete rewrite based on what was working and what wasn’t, aiming for a highly modular, yet lightweight system, and now things are progressing at full speed , so it was time for a “public anouncement” of the state of the project, since i still get quite a lot of emails of people wanting to use it/participate. This article is meant to represent the current state of the project, and since its mean to be usable (hopefully) usable, and community driven, i would really apreciate any feedback ! If you think the whole thing, ore certain aspects of it are absurd, or unusable, or badly designed , or anything, don’t hesitate to contact me or leave a comment! if , like many people , you have been tinkering around with Arduinos, electronics , sensors etc, you know that it is not always easy to read through a specific sensor’s technical sheet to be able to convert raw analog/digital values into usable data. Well the “converter” type plugins are there to make life easier : they will be a user generated, shared library of conversion functions, so that once someone has figured out a good conversion formula for a specific type of sensor, anybody else can just use that code automatically! When you add a new sensor , just set its model name (the name of the actual physical sensor) , and if that converter exists, it will automatically be used when retrieving the data. A small note about this: for now automation runs on the python host side, but i plan to have it be settable : if you want some time critical triggers etc, they will also be settable directly on the Arduino side of things , so there is no delay. Small memory usage: the tests i have done for now of what an average user might use/have, generally come with a less than 4 Mb memory consumption, although this is not set in stone, as the software is still not as feature rich as i would like, and in a pre-alpha stage. While the core of the system is functional , a lot of parts still are not ! 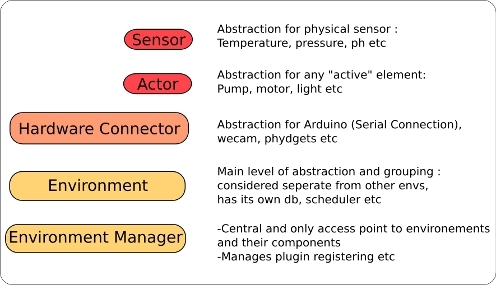 it makes sense for the sensors of an Arduino to be “inside” a software abstraction of it (the ArduinoNode) : the list of sensors is actually stored inside of the the ArduinoNode data structure , and there are methods to access the sensors by type, by id , etc . Connectors would not Contain Sensors anymore, connectors would simply set themselves up/connect to the hardware , to Provide an access for sensors, would would just have a reference to the connector they use. This would also reduce the effect of having to use the Node as proxy aswell as a connector : currently , to communicate with a specific sensor , you have to go through : the environment->the node manager->the node …. ie for bottle rigs use one position with an inverted u shaped tube for overflow.. the top of the inverted u is your maximum fluid level you want in your bottles to prevent overflow. Also use a cheap bilge pump on 12 volts for the pumping and keep on for the entire soak period and turn off when you want to drain. These pumps will NOT run at 5 volts properly. Bilge pumps are preferred because we are dealing with very salty water in hydro solutions and that water is very trashy with media in most hydro setups. I use a sanguino in my system with a 49.95 I2C 16 channel relay board from http://www.inexglobal.com each relay can handle dc/ac up to 240V 5 amps supposedly I use for 5 amps at 12V. I have seen your entries about arduino + hydroponics in the past but Im really happy that you have renewed your interest in the project. Ive been working on basic atmospheric control and automation for my own arduino based hydro system but mine is MUCH less polished than your own. The use Python is very promising and very much over my head SO props to you for the time and energy invested in this project. Myself and many others with less polishing skills are anxiously awaiting your updates! Thanks a lot for the kind words ! Have you been working on your project for long ? Simpler is often better ! Do you have a webpage for showcase? Stay tuned for more news, and hopefully once i really feel it is right, the full software and code! The whole area of arduino / 3d printing and open source hardware is really appealing to me right now. When I thought about growing my own food i immediately thought of a hydroponics system built on arduino. I’m not a programmer though. Really interested in this project but havn’t seen any updates on Google Code page since last year. Hopefully you are still working on it! Hydroduino was concieved from the start to appeal to non programmers as well , so there is a lot of effort beeing put into that aspect as well. I actually don’t use the google code page anymore, and didn’t want to post more articles on it because it really might seem like “vaporware” by now, however , i am still working on it, pretty much along the lines outlined in this article . Are you working on similar projects (arduino/gardenning/hyrdoponics) aswell? hey mate – are you still working on this? I’m a software developpment engineer , and hydroponic gardener at night…. I wanted a DIY controller ,bc all the good proprietary one is very expensive. I’m starting my own controller on an arduino platform. Once done i will post back all schematic and software , this (i hope) will be my contribution to the DIY Grow world. Would you mind posting your code please, i will post you back any enhancement done . Would like to contribute but starting from scratch. Hope you will read this . I’ve tracked googlecode and github but none of your source file could be found. How does one get in contact? I can’t find an email button!